As the Internet and mobile technologies have grown in importance, so has the concept of the business or product revenue model. Quite simply, a business, revenue, or product model delineates how a company will make money from its products. While most business models involve making money in traditional ways (selling your goods and services from stores, offices, and factories) and through your Web site, there are some inventive product strategies that you can use to make more money. Once upon a time, if someone wanted to buy lettuce, they would go to the grocery store and select a head of lettuce that did not have any brown spots or wilted leaves. Lettuce that had defects did not sell and was thrown away. Then someone got the idea to salvage the lettuce by cutting away the bad parts, triple washing and drying it, and putting the leaves in sealed plastic bags. The resultant new product sells for more than a head of lettuce because many are willing to pay for the convenience and time saved. Therefore, the Lettuce Strategy gives us at least three additional ways to make more money. Find buyers for the discarded parts. For food items, the parts that are thrown away have value to others for making mulch, fuel, and other products. Therefore they can be sold or at least picked up and hauled away at no charge. This has environmental as well as economical benefits to both business and society. One of my Fortune 500 clients invented a new transparent material that was much stronger than glass. In the manufacturing process, a significant amount of the material was wasted because it was not "perfectly" transparent. When I asked client personnel what they did with the scrap, they said, "We throw it away." Even worse, they paid someone to dispose of the waste. In the marketing plan I created for them, I recommended the Lettuce Strategy and found a buyer that did not need transparent material for the scrap. The buyer, a former designer for another Fortune 500 company, was happy to create new products from the material that was discarded. Not only was this win-win for my client and the buyer, it also saved the cost of disposal and avoided having to dump the material in landfills. For many years, jukebox and game device companies identified restaurants, bars, and other places of business that had unused space where they could place their machines so patrons can put money into them and play music or games while eating, drinking, or engaging in other activities. In exchange for using the available space, these companies split the revenue generated with the owner of the space. Google adapted this strategy to the Internet. For Web site owners that agreed to put a Google-branded search bar on their Web sites, Google split any ad revenue generated via searches that originate from owner-hosted search bars. Web site owners could earn additional money in exchange for giving up a little amount of their Web space. Google gained in at least two ways - it (1) generated more searches and sales for its advertisers and (2) promoted the Google brand to whoever visited those Web sites. King Camp Gillette is credited with inventing the "razor and blade" business model that many refer to as the "Gillette product strategy." There are many stories and myths around how this strategy was invented. In all of them, Gillette created a safety razor that used disposable blades. 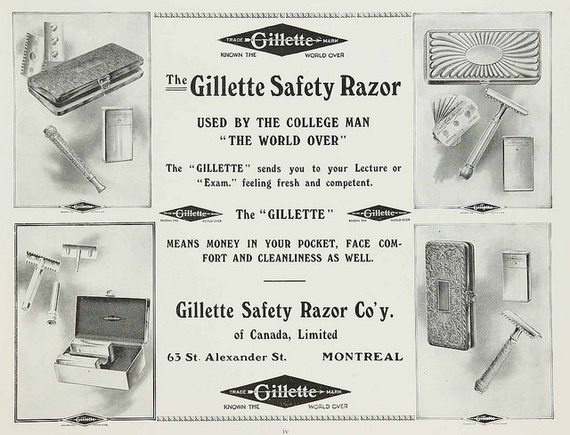 Initially, the razor was expensive, and after some years when the patent on the razor expired, Gillette realized that the more Gillette razors that were in the hands of potential buyers, the more blades he would sell. Therefore, Gillette started selling the razors at a lower price to increase the demand for blades, which carried a much higher gross profit margin than the razors. His product model became (1) give away the razor (or sell it at a lower price) to get it into the hands of as many people as possible and (2) make the "big money" from selling high-margin replacement blades. Many companies have adapted this strategy to their businesses with great success. Low-end inkjet and laser printer manufacturers sell their printers for a price that is at (or near) their cost, and make money from selling ink and toner cartridges. Amazon sells the Kindle Fire at or below cost with the objective of facilitating sales of products from Amazon's online store. Arthur Andersen (which morphed into Accenture) used a similar strategy when it won the bid for the air traffic control system at Chicago's O'Hare Airport. It bid $0 for doing the job, but proposed charging the airport a penny for every takeoff and landing in perpetuity. What do all three strategies have in common? The Lettuce, Jukebox, and Gillette strategies have something in common. They provide inventive ways to create win-win opportunities for buyers and sellers. Customers can "buy" without significant risk as sellers can make more money. Lettuce Strategy. New products are created by adding value, such as customer convenience, while minimizing product defects. Customers are willing to pay more for these products because the added-value and lower risk of defects more than compensates for the higher price. The seller can also make money from the parts typically discarded or, at the very least, trade them for free pick up and disposal. Jukebox Strategy. There is little or no cost to the owner of the space, but there is considerable money that can be made from a split in revenue with the owner of the jukebox. Gillette Strategy. The initial investment is minimal, and the buyer buys and uses the consumables as needed without having to maintain them. The seller generates more revenue and profit as more of the consumable components of the product are purchased and used. The hope is that you will be able to visualize how these strategies might apply to your business. Even if they are not directly applicable, perhaps they will spark ideas for you to create new successful revenue models for your business. If you do, please let me know. As always, best of luck.